The crowded dial of the CV2A10.BA0796 is a traditional silver-on-black plate. It looks more like the gauges on a car than something that should ever hook onto your wrist. As far as high-luxury watches go, many of them are worth their weight in cold hard cash. Fashionistas of all ages can get behind the Tag Heuer brand as a supplier of high-quality accessories – however their Carerra CV2A10.BA0796 Day Date Men’s watch is a design that the fashion world has seen many times… only for double the price. 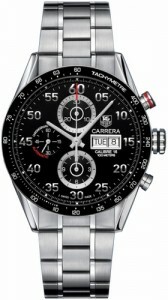 Like many watches in the Formula 1 line from Tag Heuer, the Carerra CV2A10.BA0796 is equipped with a sapphire-crystal water resistant cover. Its face plate is ceramic and the watch band is brushed steel which provides a rougher texture and prevents the appearance of unsightly smudges and grime from accumulating. It functions as a traditional timepiece with its clearly marked white numbers and also has a dial for the current day’s date. It comes equipped with a chronograph and, like many luxury watches, a warranty and lifetime-replacement guarantee for its batteries. As a Tag Heuer product, the watch is of course made well. The finest attention to the deployment-style clasp and chain links on the band ensure that pinching is a thing of the past. It has a large, eye-catching frame that will coordinate easily with all manners of outfits. if the traditional silver and black does not convince you, the Carerra line has many similar models in varying shades of platinum and black to suit more tailored tastes. The craftsmanship of this model is so well thought of that it has its own warranty. That is a very confident manufacturer. It is not the quality of the watch that is questionable, however. The drawbacks of this watch are, unfortunately, more numerous than its perks. The clock is crowded and looks like nothing more than a sports watch hooked to a steel band. Unfortunately, the CV2A10.BA0796 does not even have all of the features of a modern sports watch to make it worth the forty dollars one might pay at a local store. Unlike many later lines in the Tag Heuer collections, it is only water resistant up to 300 feet. The band is average, the clock itself is far from stunning. Why its starting price is $4,400 is baffling. It is clear that the estimated selling-price for this item has been recognized for the gross over-estimation that it is, because all over the internet, sales have dropped this monstrous price tag down as low as $2,595 – to almost a full half of its retail value. Whether the archaic style of the CV2A10.BA0796 is to blame for its wild lack of success in the market, or simply the utter lack of “wow” that its limited features provide, I recommend that you keep your wallets safely tucked away for this member of the Carerra line.